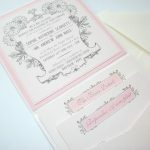 Charlie loves Lucy is the fabulous creation of Claire Hawkes, who works out of her studio in Kent designing wedding stationery. We first saw her designs at the Bluewater Wedding Fair and thought they were totally gorgeous! Claire has a passion for beautiful design and typography and says “we want to create exquisite stationery that’s packed with personality and without compromise”. With over six years in design Claire’s love for all things printed and has seen her business grow and now “The Tea at Elaine’s” design comes in five colour ways; Blush, Sage, Bluebell, Lemon and Mocha. I personally wouldn’t be able to choose – love them all! Claire can either give you a completely bespoke design or you can choose from one of her fantastic ranges, some of which are shown below.